On Monday, March 26, US Senator Rob Portman stopped by Lima Pallet Company to talk with owner Tracie Sanchez and her employees about how the Tax & Jobs Act was making a difference. Lima Pallet has been a member of NFIB since 1992. He also met with additional NFIB members on-site and heard their stories of the positive impact of tax reform, and even got put to work helping to repair a pallet, participating in NFIB’s Small Business Challenge. 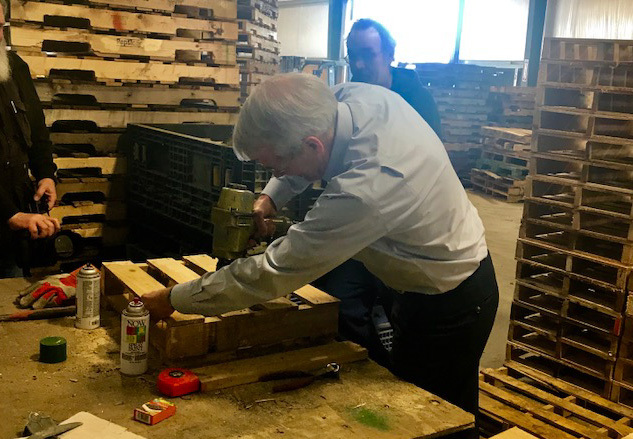 Senator Portman helps with pallets at Lima Pallet Company. Prior to visiting Lima Pallet, Senator Portman and NFIB/Ohio Vice President and Executive Director spoke at the Lima Rotary Club. If you have a tax reform story to share, please e-mail Andy Patterson in the NFIB/Ohio office at [email protected].